Striped Linen Pants by Rich Famous. Now you can look vacation ready on any day of the week with these striped linen pants. Cool and lightweight pants made from soft linen blend ideal for warmer weather. 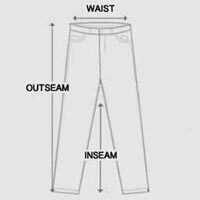 Tapered pants constructed with belt loops, four-button fly, side pockets and faux welt pockets on rear. Striped linen pants include a partial elasticized waist on the sides with an adjustable drawstring tie. Casual beige pants that look great paired with either button-down shirts or plain tees. Striped linen pants are an effortless way to add boardwalk vibes to any outfit.